It has been a long time People! I almost forgot my writing stuff when I was in the country for a couple of weeks. You may know that the parental units had a conference in Germany so while they were gone I got a vacation from THEM. It is always nice to be able to run in the country and hang out with my friends. I even lost some weight, showing how even canines can lose weight given the right amount of activity and I don’t even need a FibBit! Speaking about loss we lost a couple of family members, Grandma Dopart and Aunt Mary within 2 weeks time. This has been a sad time so I have been giving Mom extra snuggles to comfort her. Mom told me Grandma would always ask how the “puppy” was – little did she realize I am beyond the size of any puppy! This week I have been doing better with my interior barking at the outside dogs. There was a couple of times that the neighbor dog, Henry, my new nemesis was peeing on my bushes in the front and I did not bark. 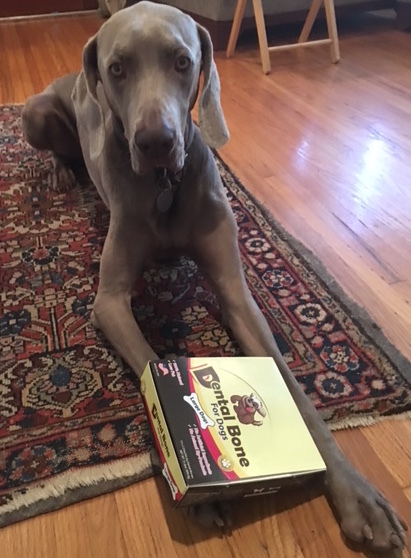 Dad was excited and gave me one of the Dental Bones from Mercola, which is not only tasty but healthy for my teeth. Little does he know I am really training him! WINK! I stole the box off the counter and Mom caught me but I was disappointed there was none left so helpfully they will buy me more. The weather continues on a schizophrenic course of being hot and humid. Maybe we will not have fall? OK folks, have a great week and remember to be safe and responsible this Halloween. I am saying ahead of time I will not dress up this year and if Dad tries to put a costume on me again I will hide in rebellion. Missed hearing from you Perry, glad we reconnected, you and I met years back , specifically in 2012’ when I worked seasonal at Wm Sonoma on Montana, I did work there again season 2013’ but now I’m busy in Venice, with tutoring at a non-profit, raising funds for UC Berkeley and working at my regular job, glad to hear your progress, my two beloved dogs, lady, 11 years this month since we rescued her, and Blue we rescued Mother’s Day ‘2014, we are a great family. Hope to meet you again.